5 stars. It was wonderful dealing with the people at this company! This is the only company that offered to send me samples of a backsplash tile. I spent hours and hours looking at backsplash tiles on line and they are the only ones to have exactly what I wanted. The price was great and my contractor was impressed with the quality and the speed with which we received the tile. Everything is so beautiful I want it all. From the designs to the kitchen and bathroom displays and the lighting wow. Great prices and very helpful you need to stop in you will be very impressed. I was pleasantly surprised when I came into Unique4Home recently for my kitchen improvement project. The sales staff was extremely helpful and concentrated on my requirements and budget rather than trying to sell me something. I was able to accomplish everything I needed. I highly recommend Unique4Homes for any type of improvement project around the house. We worked with Dimitry to redo the shower in our master bath. The stone tile he showed us was unlike anything we had ever seen; absolutely beautiful…. We ended up tiling the walls and ceiling! We described what type of rainfall/showerhead we were looking for and he put together the perfect package for us. They also replaced our old mirror/lights and added new recessed lights and heater. What a difference!!!! The bathroom turned out so great that we decided to do the kitchen as well! Although we kept our existing cabinets, he made it look like we had a full kitchen remodel. When he helped us pick out our beautiful 4piece faucet, we thought for sure that would be the focal point of the kitchen. But now, after adding such unique backsplash, granite, cabinet handles, pendant lights and a stone tile wall it’s impossible to decide what we love the most. I really appreciated all the little things he recommended that I never would have thought to do….new grout made just for glass tile backsplash, under/over/inside cabinet lighting, and hidden outlets are just a few. We are just so happy with everything we found there and for all the help putting it all together. Their showroom is full of great new ideas, but if you have something in mind that you don’t see, let them know. I’m convinced they can find it for you (for a better price AND better quality than anywhere else). Everyone there was so helpful and patient with us I would definitely recommend at least stopping in to check it out! I had the pleasure of meeting Dimitry and Anna while looking for someone to redo my master bathroom. They have just recently opened up a design studio in Forks Township. 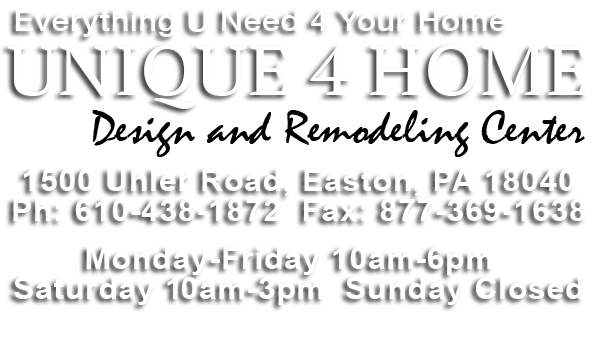 If you are in the market to do some remodeling to your home, or just want some new fresh ideas, Unique 4 Home is a great place to go! They have many different things to choose from in the studio, rather it be for the bath, the kitchen, flooring, lighting, or anything you are looking for, they have it! They will sit down and work with you and are happy to answer any questions that you may have. Stop in and see them. You will be glad you did! Very professional and helpful. I know I will be using them again for my next project. Overall, they did an outstanding job. Their staff is very professional and polite. They didn’t cut corners and did the job right. In our case, we worked with their recommended architect and got the result we wanted. We are absolutely thrilled with the outcome and we thank Dimitry for the job well done. We would use them again in a heartbeat. We called Dimitry in August and the following week he came to look at the project. He was very professional, knowledgeable and businesslike in knowing what we wanted done. Dimitry continually kept on top of the progress his workers were making and overseeing the order of extra items needed. His workers were extremely knowledgeable and proficient in their performance. The quality of work Dimitry expects is very high. We contacted several contractors this past summer. One was so high priced he was immediately disregarded while others would not put anything in writing unless we signed a contract. We went to Angie’s list and found Pocono Luxury Home had a very high rating. We contacted Dimitry and he met us at the house. He was very businesslike, professional and knowledgeable. He understood what we wanted right away and suggested we meet again at his showroom. We went to the showroom and met Anna who was very knowledgeable in designing and she showed us numerous options in tile. She suggested a mosaic to go along with the tiles and we agreed. Work started soon after. The workers (Johnny, John, Robin and Carlos) were very considerate, open to changes in the original plan and did a great job on the finished product. Dimitry put us in contact with a Quartz supplier and a glass shower door manufacturer. During the process Dimitry was on top of every issue. Several weeks later the job was finished. To say the least the finished product is FANTASTIC. The bathrooms look like what you would expect to see in a showroom. The tile colors, mosaic and herring bone like pattern are a perfect match. The frameless glass doors make the room look larger and the additional lighting brighten the rooms .We are more than very satisfied with the end result. We have to look twice to make sure we are in the right house when we enter the bathrooms. We supplied the fixtures, cabinets etc. The price was reasonable for the workmanship of the job. This was the only contractor that really listened to what we wanted and provided a design that gave us everything we imagined. He was terrific at coming up with great ideas and making wonderful recommendations. He used pocket doors to give us maximum room, closed off a door which allowed us to create a linen closet with hamper, and gave us heated floors and a heater in the ceiling. He also suggested a smart tint window in the shower so that we could have light when we weren’t showering and with the flick of a switch the window is blocked out to shower in privacy. We love it! He was a perfectionist and if he didn’t like it he made his team redo the work. He made a beautiful stone wall on one side of the shower that totally captured the lake feeling we wanted. We wanted two sinks and I wanted a vanity in the middle. He had to custom make this unit and he added granite countertops and special crystal pulls that were the perfect touch. The sinks are vessel sinks and I have the vanity with mirror I always wanted. The bathrooms turned out elegant yet the stone and wood used made it also seem perfect for a lake house. We could not be happier with the results. Our neighbors all think it is beautiful as well. Dimitry and his crew were great, as usual. We had a deck plan set and an estimate all ready to go. Then, at the last minute we had to make changes and Dimitry was more than willing to comply even though the new deck design was different. We called on a Friday and he and his men were at the house the following Tuesday (this was around Memorial Day weekend). The guys built the main deck and then also built a deck to go around the above ground pool we were having installed. They then had a company come out and lay the brick pavers. They had to build temporary stairs for us since the job was not complete by the time our son’s birthday party had come (no fault of theirs). They came back after the party and finished the steps and the rest of the railings. Communities in Schools of the Lehigh Valley is grateful for your donation of $705 to support integrated Student Services. Your support will ensure the continuation of our mission which is “to surround students with a community of support, empowering them to stay in school and achieve in life. Our evidence-based program reduces student drop-out, improves attendance, reduces behavior issues and ultimately moves students to graduation. Currently, Communities in Schools of the Lehigh Valley serves over 12,000 students throughout Allentown, Bethlehem Area, Easton Area and Whitehall-Coplay school districts.